Dubrovnik and Split are among the top five most visited cities in Croatia, so it is no wonder that many of you are looking for the right information on how to travel from Split to Dubrovnik (or from Dubrovnik to Split) – this webpage will enable you to find the right, verified and up-to-date information. Split and Dubrovnik are located in Dalmatia, which is the largest tourist region in Croatia. Dalmatia covers the area of about 12,260 km2 or about 22% of the Croatian territory. Dalmatia is an elongated coastal belt, about 400 km long and 70 km wide in its central part. In its vaster north-western part it is surrounded by the mountain chains of Velebit, Dinara and Kamešnica, while in the south-east natural boundary is less pronounced and it is located in the immediate hinterland of the narrow coastal strip. Those who are looking for heaven on Earth should come to Dubrovnik” – is a famous quote by George Bernard Shaw which can be found in any tour guide. Dubrovnik is the most popular tourist destination in Croatia – often because it is a top destination, tourists who know little about Croatia think that Dubrovnik is the capital but actually the capital of Croatia is Zagreb. Since 1979 the old town has been under the protection of UNESCO. Dubrovnik is a small town with only 50 000 inhabitants, however, more than one million tourists visit it every year. It is a beautiful city which is often called a living museum. It is surrounded by the medieval walls 1940 meters long that have been preserved in their original state and as such are certainly the biggest attraction. Tourism and tourists are not new to Dubrovnik – the opening of the hotel Imperial in 1887 is considered to be one of the earliest events in the history of tourism in Dubrovnik. Information on the first international conference held in Dubrovnik can be found in the archive documents from the same year. How to get from Split to Dubrovnik – travel guide! How long it takes from Split to Dubrovnik? Journey time from Split to Dubrovnik is about 3 hours. How can I book a private transfer from Split to Dubrovnik? To book a private transfer from Split to Dubrovnik click here! How much is a taxi from Split to Dubrovnik? Taxi from Split to Dubrovnik is about 2.100 kn. How much is a private transfer from Split to Dubrovnik? The cost of a private transfer from Split to Dubrovnik is 1.687 kn. 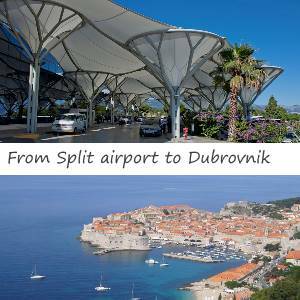 How can I book a private transfer from Dubrovnik to Split? To book a private transfer from Dubrovnik to Split click here! Is there a train between Split and Dubrovnik? No, there is no railway line that connects these two towns. How long is bus ride from Split to Dubrovnik? Traveling by bus takes 4.5 – 5 hours. Split is the second largest city in Croatia and approximately 500,000 tourists visit it every year. Ten years ago Split was considered to be mainly a transit centre, however, in the last couple of years the situation has changed significantly so Split has become a popular tourist destination where tourists stay several days and book one-day excursions so they could visit the smaller nearby places such as Trogir, Hvar, Krka National Park, Omis and others. When it comes to traffic, Split is still the most important hub. It is the centre of sea, road, railway and air transport. City port records steady growth in passenger numbers and with a turnover of nearly 5 million passengers it is the third Mediterranean port (after Naples and Piraeus). The city`s origin is associated with the construction of Diocletian’s palace from 295 to 305 A.D. The biggest attraction of the city is Diocletian’s palace. The palace was named after its creator, the Roman Emperor Diocletian. Today palace is the centre of the old town where people still live, and perhaps this is what fascinates every tourist that wanders the narrow streets which are 17 centuries old. Diocletian’s Palace is one of the most significant ancient buildings, the largest and the best preserved late antique palace in the world. Unfortunately there is no railway line that connects these two towns – therefore taking the train is out of question. Alternative to train is certainly the bus – and in most cases, when we talk about the coastal part of Croatia, it is the first choice of travellers who do not want to spend a lot of money on transport. From Split to Dubrovnik (and vice versa), there are numerous departures – approximately every hour, but for more details click here. Travelling by bus takes about 4.5 – 5 hours, but it largely depends on the day of the week, for example if you travel in high season (July and August) and especially on weekends, journey can last up to 7 hours. One of the reasons for this is that you have to cross the Croatian-Bosnian border twice! Let me explain: on its route the bus passes through the so-called Neum corridor, which belongs to Bosnia and Herzegovina. This is a small corridor of only 15km but the problem is that you are required to go through police and customs control twice. When travelling by bus, this control is regularly done while when you go by car sometimes they do not even check the documents. Price of the ticket is from 120 to 150 kuna, so if you are travelling alone, if you want to save money or comfort is not your top priority – then the bus is the right choice for you. This kind of transfer is the fastest and it takes 3-4 hours, depending on the traffic and the jam at the border crossing Neum. The transfer price is 200-250 Euro (depending on the size of the vehicle). Note: this type of transport is especially suitable for groups of four to eight passengers, so depending on how many persons are in your group this kind of transfer can cost you a bit more than bus but the advantages of a private transfer don’t even need to be emphasized. If you take a private transfer (door to door service) from Split airport to Dubrovnik the price is 250 euros. So for only 52 Euros more you get a lot more and you don’t have to trouble yourself by taking the bus. For those who like to drive through unfamiliar routes by themselves this is certainly the best choice. However, if you do not plan to rent a car for more days and your plan is just to go from Split to Dubrovnik, you must know that the cost of the car rental (in high season) and the cost of fuel will be as high as the cost of a private transfer. I would recommend this to people who plan to spend at least 5-6 days in Croatia and see various attractions but it is certainly not a good choice for those who need only a transfer from point A to point B. Currently there is no ferry line (for vehicles and passengers) between Split and Dubrovnik. The route of the coastal line used to be Rijeka-Split-Dubrovnik but a few years ago it was cancelled due to unprofitability. Currently, there is a rumour that the coastal line could be introduced again. If that happens you will be properly informed on this website. Instead of a ferry line there is a speed boat (catamaran) run by the company Captain Luka. The journey takes 4 hours and 20 minutes, the price is 190 Kuna. This option is good for those who can adapt to the sailing schedule and who do not suffer from seasickness ? In summer period from 01/06/2019 to 31/08/2019 catamaran from Split departs at 7:40 am and arrives to Dubrovnik at noon. For those of you who think that this is a good option for casual tour of the islands, I have to disappoint you because this type of vessel (catamaran) is not similar to ferry where you can walk along the open decks, catamaran is something like a bus on the water with blurred windows. I’m sure many of you would choose a plane trip from Split to Dubrovnik, but unfortunately it seems that this route is not profitable, therefore, there are no daily flights. There are flights on certain days but for more information please visit Croatia Airlines website. One option is transfer with a professional guide and the other is only a transfer with a driver who is not a professional guide but who speaks English well enough to show you certain sights and attractions along the way. Departure from Split at 7:30 am and arrival to Dubrovnik at around 11:00 am. If money is not an issue, why wouldn’t you choose yacht or boat transfer and be able to stop on the way and see different locations on the islands of Hvar and Korčula.